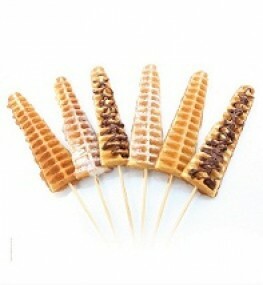 What could be better than a waffle on a stick coated in powdered sugar? A Waffstick covered in chocolate, perhaps! Also choose from marshmallow, peanut butter, caramel or strawberry sauces. And, try our new creative syrups, such as bubble gum and cotton candy! The world-famous WünderBar starts with a generous piece of Pie Piper cheesecake, dipped in premium chocolate and served on a stick.